Jet lag did not let us down and woke us up at 3:00 AM after having crashed out a little before midnight. Fond memories of business travel. Surprisingly, we managed to get back to sleep and stayed that way until just after 6:00 AM. After an enlivening tea and couple of stimulating coffees, we decided to be very un-American and enjoy the warm, sunny morning walking the mile and a half or so into Tomales for an initial investigation. We had designs on our traditional first breakfast in the States: bagels. Naturally there is no sidewalk along the road into Tomales so some care was necessary walking in the road. Things were made easier by the fact that the road was being resurfaced so traffic was escorted and quite slow. Our walking didn’t seem to cause too many raised eyebrows. Things were warming up nicely with the temperature topping 80°F already. 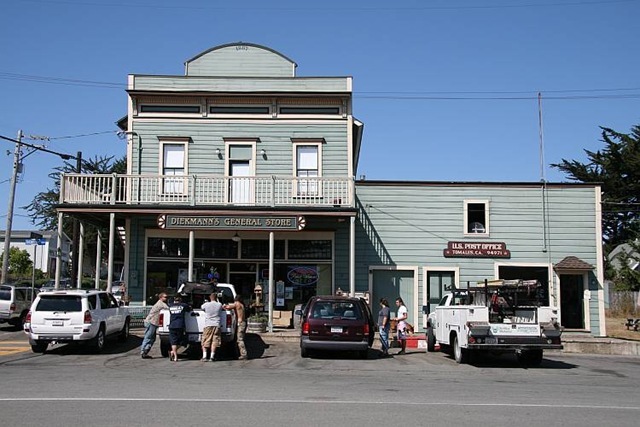 Tomales is essentially one crossroad with a general store, bakery and hotel occupying three of the four corners. One building looked particularly intriguing being labelled “Not a Bank”. It clearly wasn’t a hairdressers either but that was seemingly not worthy of note. Judging by a book photograph, Tomales has changed little in the last hundred years. I suspect that some of the paint hasn’t changed much in the last 100 years, either. We headed for the bakery in search of our bagels but, bagels being in short supply, we settled for a couple of almond croissants. Breakfast sorted. In addition to we two walkers, a steady stream of cyclists seemed to be keeping the bakery in good business. We crossed the street to familiarize ourselves with the the general store. This proved to be a glory hole of food, household items and hardware. I think the collection of ammunition is included in the hardware section because it was right next to the fencing staples. Our return trip was decidedly warm and I was feeling a little overdressed; we were up around 90°F but fortunately it’s a very dry heat. Finally this year, we have found something resembling a genuine summer. Bets grabbed an hour off work to introduce us to Tony’s Seafood on Tomales Bay for lunch and I realized that I had been here before many years ago for some oysters. This time it was fish tacos all round. Mexican style food – now I know we’re in America. Our charge, Bryan’s cat Betty, put in a rather brief appearance in the early evening and prompted cat-feeding lessons. Slowly but surely we are getting there.